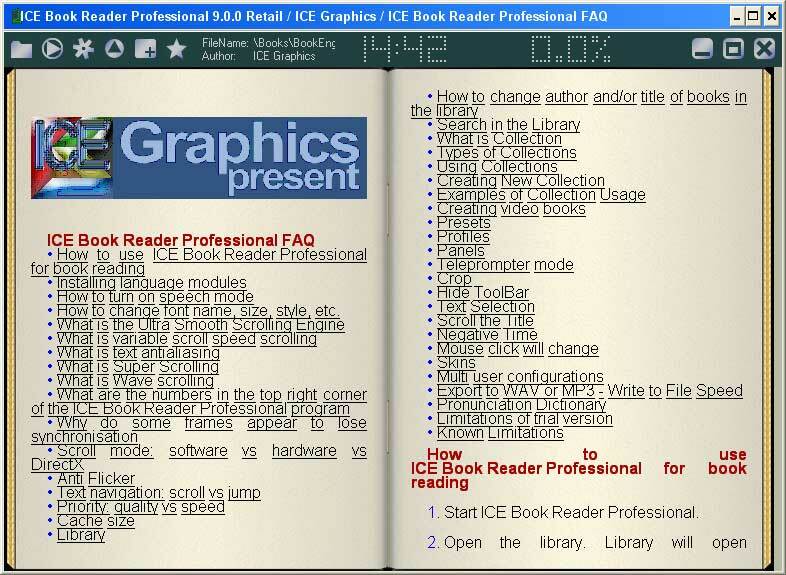 ICE Book Reader Professional is an ultimate e-book reader and MP3 creator with native support TXT, RTF, HTML, MS Word documents, PALM books and Microsoft Reader (.LIT files). Ultra smooth scrolling, full text antialising, super scrolling with subpixel precision, wave scrolling, complete support Unicode and all known codepages, ICE Book Reader Professional's built - in a code archivers ZIP, RAR, ARJ, LZH, HA is only small list of opportunities. ...... PDB and .PRC) and Microsoft Reader Books (.LIT). Ultra smooth scrolling with the exact control of scroll speed, automatically adjusted scroll speed, full text antialising, super scrolling with subpixel precision, wave scrolling, complete support Unicode and all known codepages, automatic text reformating, automatic text coloring, the system of an artificial intellect recognizing a format of the text, the programs built - in a code archivers ZIP, RAR, ARJ, LZH, HA is only small list of opportunities. Due to using multithread engine ICE?Book?Reader?Professional provide fastest way for creating MP3 books. Multiple SAPI engines can "talk" simultaneously, decreasing creation time of MP3 books. Qweas is providing links to ICE Book Reader Professional 9.0.7 as a courtesy, and makes no representations regarding ICE Book Reader Professional or any other applications or any information related thereto. Any questions, complaints or claims regarding this application ICE Book Reader Professional 9.0.7 must be directed to the appropriate software vendor. You may click the publisher link of ICE Book Reader Professional on the top of this page to get more details about the vendor.